On the road again……Willy would be proud! US-101 was still closed near Garberville, CA this morning and Caltrans does not offer any end date to the closure….apparently the mudslide is quite large. 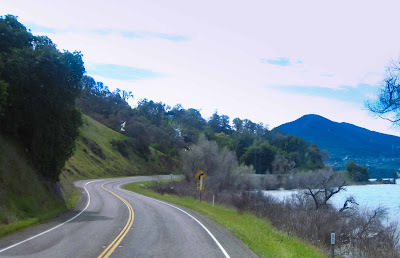 Our route of choice today was Hwy 20 through Lake country over to I-5 and then north into Redding for the night. Hwy 20 was a good road most of the way but got a little slow, twisty and windy going through some of the smaller towns along the edge of Clear Lake. We were surprised by a hawk that flew in front of the motorhome as we rounded a corner near Mendocino. I think the hawk was more surprised by us though as it dropped a large clump of dirt from it’s talons onto our windshield as it tried to gain altitude as quickly as possible. I can’t be sure but there may have been a mouse in its talons too. Ditch the dirt but keep the mouse…..think I would do the same thing if it were me. Rounding the bend by Clear Lake we were treated to seeing a bald eagle fishing for its dinner right at the edge of the lake. Chris grabbed this quick shot out the windshield with our point and shoot. Can you spot the eagle? Hint…….Look over the yellow 45 mph traffic warning sign. It was a beautiful drive through what surely must be a very popular vacation area in the summer. Lots of lakes, campgrounds and motels. We stopped for fuel at the Trans America station in Corning on I-5 at exit 630. $4.149/gallon which is the best price by far that we have seen on the road since leaving Palm Springs. Most of the surrounding stations were all over $4.30/gallon. We pulled into the truck pumps and even managed to get the cash price with our debit card, something that we could never do at Flying Js. $287.00 later and we were on our way. We continued on into Redding and are staying at Win-River Casino for the night. Onto Klamath in the morning via Hwy 299 which will take us back over to US-101 but well north of the closure at Garberville. This entry was posted in California, Entertainment, Photography, Wildlife. I enlarged the picture and did indeed see the Eagle! Beautiful. Another very nice RV Park is right of I-5 near Canyonville, Oregon. Seven Feathers Casino and RV Resort.